Beautifully updated home 1,800 sq foot home built in 1919 3 bedrooms and 2 bathrooms. There is one king bed and two queens. Towels, linens, games and a fully stocked kitchen will make you feel right at home. Great for business professionals, families or groups. Located in the heart of Edmond with easy access to I-35, turnpike, University of Central Oklahoma, OU Medical Center, and Integris Health Edmond. Beautiful backyard with lush trees and large patio guests are able to relax on. The coziest beds and greatest sectional for relaxing nights in. 3 bedroom 2 bathroom home with one king bed and two queens. Huge flat screen TV in living room and one in master. Equipped with Netflix/Cable/HBO. High speed internet. Once your booking has been confirmed you will automatically receive checkin instructions four days prior to your arrival. Please do not contact the owner prior to this for instructions. Check in instructions are sent out no earlier than this for the safety and comfort of other guests. To make your stay more enjoyable, please download the VRBO app or Airbnb app as these are the primary platforms that this home is listed on. This was my primary home until I purchased another house in OKC which is closer to where I work. Now this space is just used as a short term rental. I could never sell it because I love this home so much! 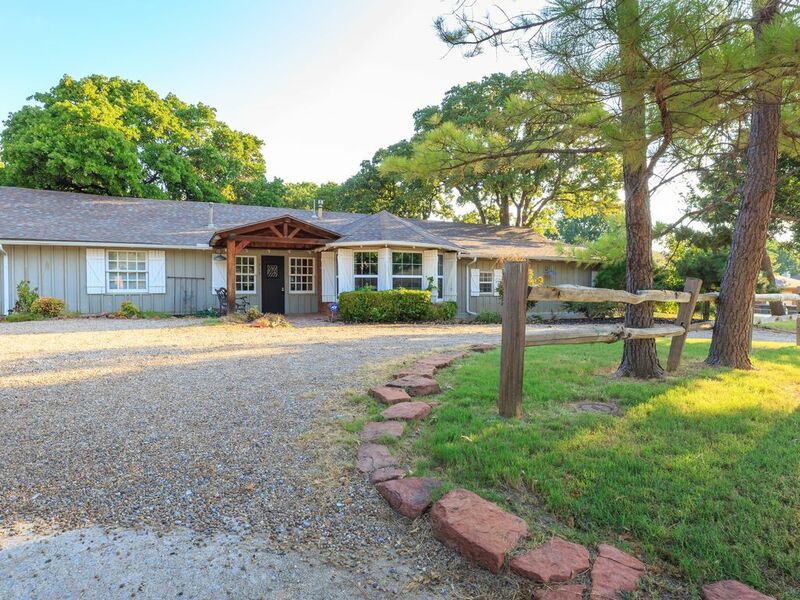 This is a great house because it was the starter home for this area of Edmond. It was originally an old hunting lodge and additions have been added throughout the years. I love older houses and this one is no exception. The modern updates make it such a beautiful property. Small annex in back with long term renter. Large backyard with separate outdoor spaces. Really enjoyed our team retreat and spending time with friends in your cute home! Loved the layout of house. Lots of open space. The neighborhood was very quiet and safe. Very close to restaurants and shopping areas, drug store, etc. Especially enjoyed Fish City Grill which is less than a mile away. Rachael, the owner of the home, was very kind and responsive to a few questions I had. Would definitely stay again if in the area! Family of 4 stayed for 6 nights while our house was being remodeled. Quiet neighborhood - friendly neighbors - Centrally located in Edmond. Footed Tub Shower in common area constantly trickles and is too small for an adult. A little creepy that there is a tenant in the guest house in the back yard - but Chris was neighborly. Hostess was very responsive - answered all emails within 30 minutes. Would definitely stay here again if needed. Very nice, well maintained property. Nice quiet neighborhood. Owner was very welcoming and attentive to our needs. I would recommend this property to anyone needing a calm quiet relaxing stay. Really cute house with lots of room. Worked out great for us and the location was very convenient. We enjoyed the nice TV’s in all the bedrooms. The wi-if worked well. The owner was very hospitable and addressed any of our concerns quickly. We loved the natural light and the warm brick. It was a convenient location as well.